Are you ready to get your grill on? BBQ season is coming or could be already started depending on what the weather is like where you live. In our home, we normally start to BBQ on a regular basis after the May long weekend. For this post, I used my indoor grill because my BBQ is kaput. I know, I need to go shopping for a new one. It’s on my to-do list. One of our favourite foods to barbecue is CHICKEN! It’s affordable, healthy and mouthwatering delicious. I made a Grilled Honey Dijon Chicken for my family and it was divine. It was super easy with a simple marinade of honey, Dijon mustard, white wine vinegar, extra virgin olive oil, garlic and fresh chives. I used chicken breasts, but you could use another cut of chicken like drumsticks or thighs. My kids prefer boneless so I usually gravitate towards the boneless, skinless chicken breasts at the grocery store. Taste your marinade before you brush it on the chicken. If you find the mustard too overpowering, add some more honey. I like mine mustardy (is that even a word?!) and it cooks off anyways. Another kitchen item I recommend to have on hand is your meat thermometer. It’s hard to tell if the meat is cooked to the proper temperature without cutting into it. For a boneless, skinless chicken breast, you’ll want it to reach 165F for safe consumption. Bookmark this handy chicken cooking temperature chart. I used a George Foreman indoor grill so both sides of the chicken cook at the same time. It also gives the nice grill marks on your meat. The honey cooks quickly so make sure you to use your meat thermometer to check doneness. Don’t rely on the colour. While my chicken was grilling, I grabbed my food steamer to make some asparagus. I’m all about the kitchen appliances today. If you got ’em, use ’em! Because most of the sauce will cook off, you’ll want to prepare extra to drizzle over your cooked chicken. It’s a two ingredient sauce: honey and Dijon mustard. As a bonus, it also tastes yummy on top of asparagus. The final result is tender, juicy and flavourful. Each bite is a little bit of sweet and spice. Make some extra sauce for dipping, if you prefer. My youngest daughter isn’t fond of mustard so I held my breath waiting to see if she would say anything when I put the plate in front of her. Surprisingly, she ate ALL of her chicken breast and most of the asparagus. It made me feel good knowing she enjoyed it! For more yummy chicken recipes, download the Chicken Farmers of Canada Shopping App. It will help you organize your grocery list, find delicious recipes to try and syncs your list in real-time with other household members. Best of all, it’s 100% free. Moist, tender, flavourful and EASY! Your family will be asking you to make this recipe again and again. 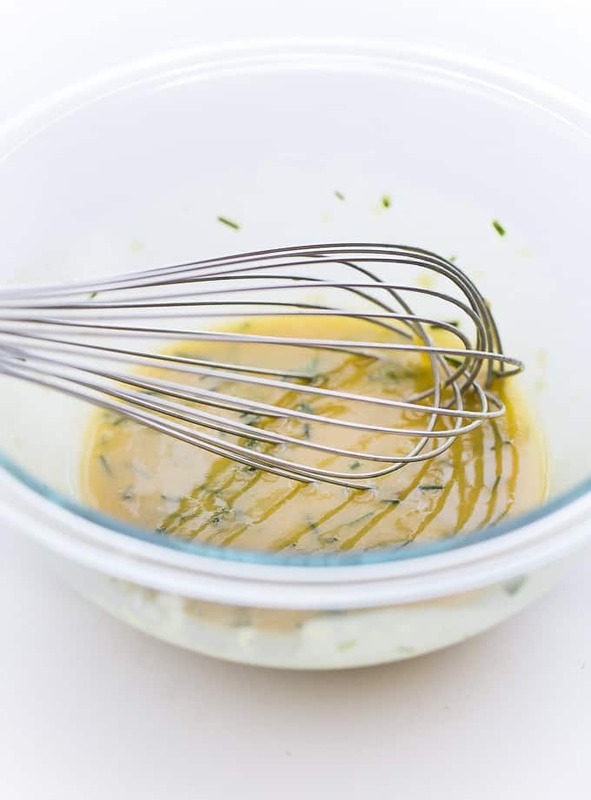 In a medium sized bowl, whisk together olive oil, vinegar, Dijon mustard, honey, garlic, chives and salt and pepper. 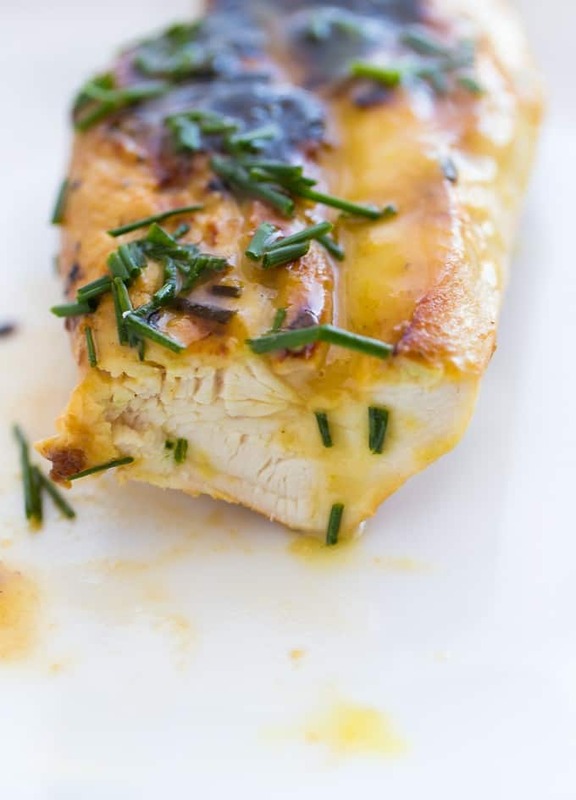 Brush marinade over both sides of the chicken breasts and put in the fridge to marinade until you are ready to grill. Place chicken on either your barbecue or indoor grill and grill until temperature reaches 165F with a meat thermometer. I used an indoor grill and it took about 10 minutes. Place on a serving platter. In the meantime, make the sauce by stirring together the Dijon mustard and honey together in a bowl. Spread sauce over the chicken and serve. I served our chicken with some steamed asparagus. Delish! This is a very nice recipe. Too bad chicken don’t natuarally grow bonelss; it would be so convenient. This looks really good and easy! We eat a lot of chicken too so it’s always nice to try out new recipes! Thanks! This looks delicious! I love cooking chicken and trying new recipes with chicken, I love the honey and will try this dijjon sauce next time I make some. This chicken sounds delish! Looks amazing and I’m always looking for new chicken recipes! 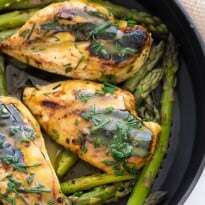 Chicken is my favorite of all and this looks really good.I will be excited to try it because it is a new recipe for me! Thank you for posting another awesome recipe for us. Chicken is a favourite and I am always looking for new ideas for using it. Thank you for the inspiration. This looks mouth-wateringly beautiful. Thanks for sharing your recipe, it really does sound delicious, it’s my kind of food too. This looks delicious, I can’t wait to try making this! what flavor! 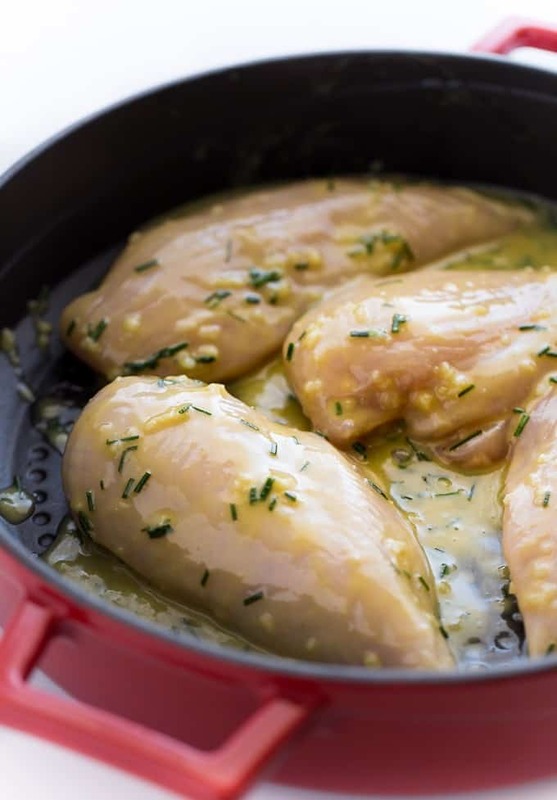 I’ll have to try this for dinner this week…..always need a new way to cook up chicken! I bet the sauce would be great on chicken and veggie kebobs….let them marinate and then rub with the sauce again before putting on the grill. We had chicken breasts out and didn’t know what to make, then I seen this earier, they are cooking now and look delicious, thanks! That looks mouthwatering. I love the glisten on the chicken! 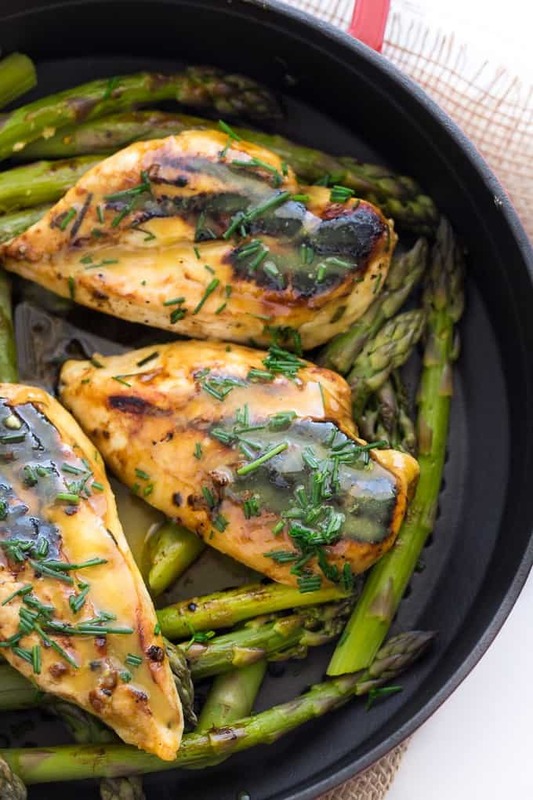 Chicken is my favorite meat to cook and this look delicious! I love this awesome chicken recipe.It’s so moist and delicious,,, & full of flavor! I love the flavours of honey and Dijon mustard together. This chicken sounds delicious! OH yum! I totally pinned this! Sounds amazing! This looks really great! I like my honey dijon extra mustardy (so a word!) too! I know what you mean about making the marinade a bit mustardy. I’m not a fan of mustard, but I find it tastes a bit more mild after being cooked. Your grilled chicken sounds delicious! This looks so yummy! I love the sweet & tangy combination of honey and dijon. Pinned and Yummed for future reference! I am definitely ready for grilling season! 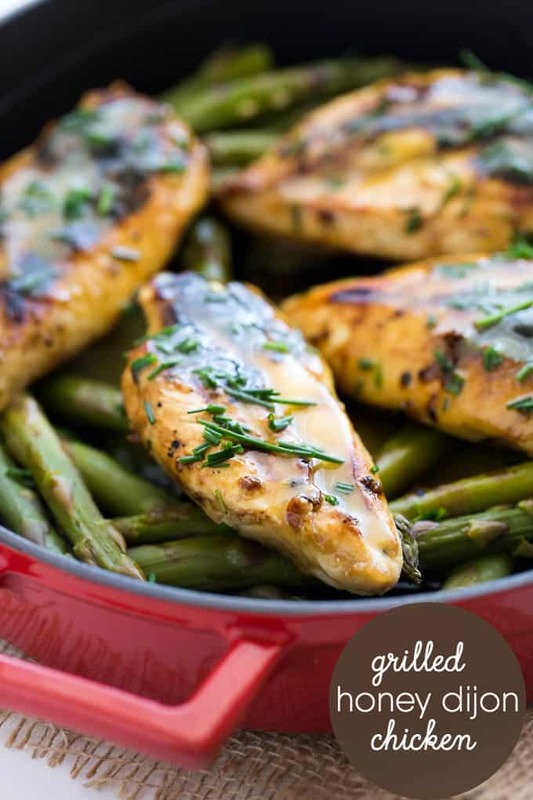 We always gravitate towards chicken too – healthy, easy and so many ways you can make it! I love honey Dijon flavored anything, so this is going to be a summer staple here! Pinned! I saw your beautiful dish at Life and LInda’s Dishing It and Digging It Party and just had to see more. I love this recipe and your photography is stunning! Great to find your gorgeous blog! Looks so yummy! Thanks for sharing at the Inspiration Spotlight Party. Pinned & shared.